When I look at how the media is reporting on virtual reality, one of the things that I keep seeing is that, because VR technology missed those early predicated sales figures set down by PR outfits looking to build hype, then the technology itself must therefore be a "dead" one. This article from International Business Times from earlier in the year is a good example. At the time, the PlayStation VR was the most successful VR unit and at "just" 750,000 units sold, and apparently that was a sign of a technology destined to failure. Quite how a journalist working for a business vertical publication somehow fails to understand the technology adoption life cycle is quite beyond me, but here we are. VR is a completely new technology product, and is therefore both expensive and poorly optimised at this stage. It's the kind of technology that only appeals to the "innovator" or "early adopter" types, and therefore anyone expecting VR to sell as well as a mature technology like a game console is someone who doesn't understand technology dynamics that well. A better comparison for VR would be to how the old Atari and pre-NES consoles sold, way back when game consoles were a complete new technology. It wasn't until the technology was refined to the point that Nintendo could hit the mainstream with the NES than the expectations of massive console sales became a reality. Anyhow, the reason I bring it up is that there's often an implication being made that because VR isn't particularly setting sales figures on fire in America/ western markets, it must be losing steam everywhere. But that's not the case at all. 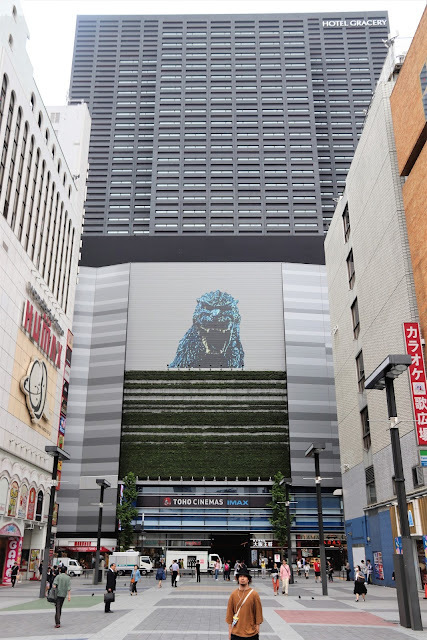 The technology may fall over completely in western markets, but after attending a virtual reality theme park in Shinjuku, Tokyo, I'm confident that VR isn't going anywhere in Japan. VR Zone is right in the heart of Kabukicho, Shinjuku. You know how the Yakuza games are all set in a city that's based on Kabukicho? The big open square that is at the heart of that virtual city is the location of the VR Zone in the real-world red light district. This theme park is built and maintained by Namco Bandai, and contains over a dozen complete VR experiences. You'll stand in skis to hurtle down a mountain of pure white powder, pedal hard to cycle a sky bike around in the heavens, and sit in an actual kart for the VR edition of Mario Kart. There are a number of themed rides - the aforementioned Mario Kart, as well as Neon Genesis Evangelion, Dragon Ball, and so, and the rides range from the joyful to the utterly horrific. You should have heard the screams coming from a horror game where you need to navigate a wheelchair-bound person through a haunted hospital. In addition to all the main rides, there were also numerous free activities (mostly opportunities for people to demo some of Namco's other VR titles, such as Summer Lesson on PlayStation 4), a restaurant selling Pac-Man themed food and drinks, and so on. Just like a "real" theme park. 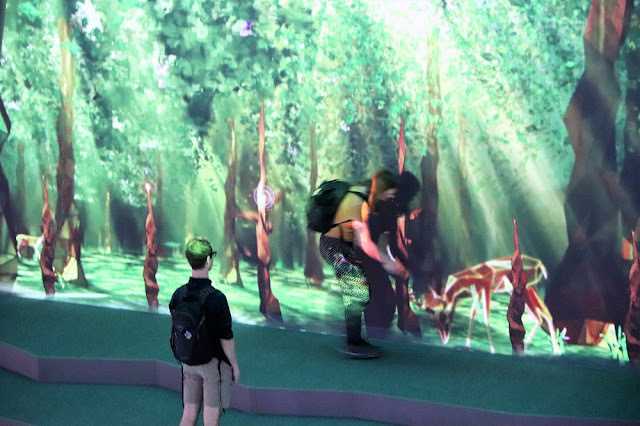 A woman feeding a virtual deer. AR technologies are going to become big too, though the technology's still a few years behind VR. These VR parks are going to be something of a saviour for both theme parks and arcades, one feels. They're hugely space effective, but can provide the same experience as a rollarcoaster or similar; add fully motion responsive carts and booths, and make good use of wind machines and the like to create the sensation of movement, and you've got an experience that closely enough approximates the real world activity for the brain to get the adrenaline rush, without needing to physically move anywhere. So building and maintaining these facilities is cheaper than what a Disneyland or Universal Studios can run for. On the other hand, unlike arcades, where the game machines you have at home are capable of doing everything that can be done at the arcade (and that being the principle reason for the decline of the arcades), home VR can't quite allow for the rich experiences that you could get at one of these facilities. PlayStation VR could run a Mario Kart-like racing game, but unless you can afford to build the actual kart to sit in (and find the room to store it), you can't have that "full" experience at home. So, for now at least, VR theme parks fit within a very real experience demand that can't be fulfilled elsewhere, at a cost effective rate for the company running the business. VR Zone was busy and popular while I was there, having already been extended beyond the original month limit that it was meant to run. And I wasn't there at night, when Kabukicho really lights up, and you imagine would be its busiest hours. Line ups for some of the more popular rides extended to as much as an hour, which is comparable to all but the busiest rides at Disneyland. Of course the scopes of the parks are entirely different, but it's a useful comparison to gauge just how in-demand this stuff is, that people are willing to wait for an hour for it. It's easy to imagine people would come back for repeat visits, too, because these games, while only being a few minutes long, are appealing like a theme park ride, rather than a videogame; and how many of you have a favourite ride at Disneyland or similar? It's just like that. 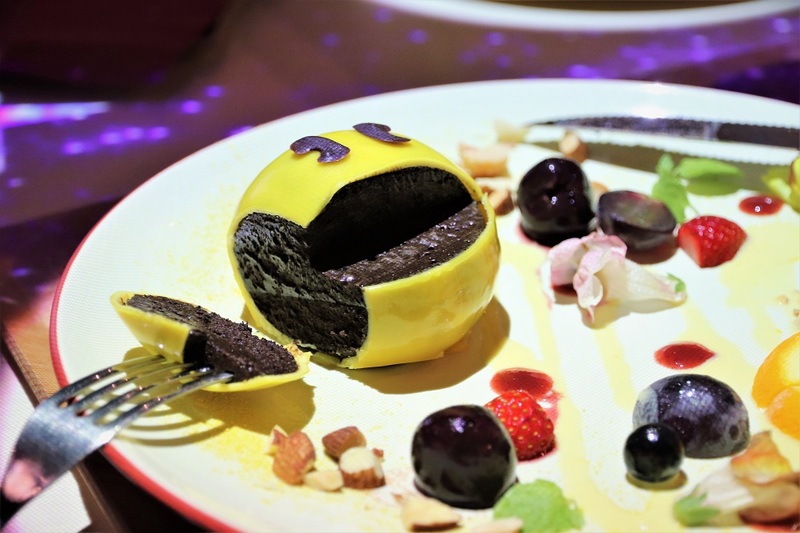 The Pac-Man cake is not virtual. It's very real. And it was delicious. Oh, and Mario Kart VR is absolutely my favourite. There is nothing as exciting in physically reaching up to throw a green shell at your wife... I mean Yoshi. Don't worry, she got me back by actually winning the race. Seriously though, the smiles of delight on everyone's faces as they played that one... it was pure dream fulfillment. To my point at the start, though; the popularity of the VR Zone and other VR events and parks that are littered around Japan shows that there is enduring interest in the technology. I also know that China is much the same, with VR development and investment absolutely booming over there. 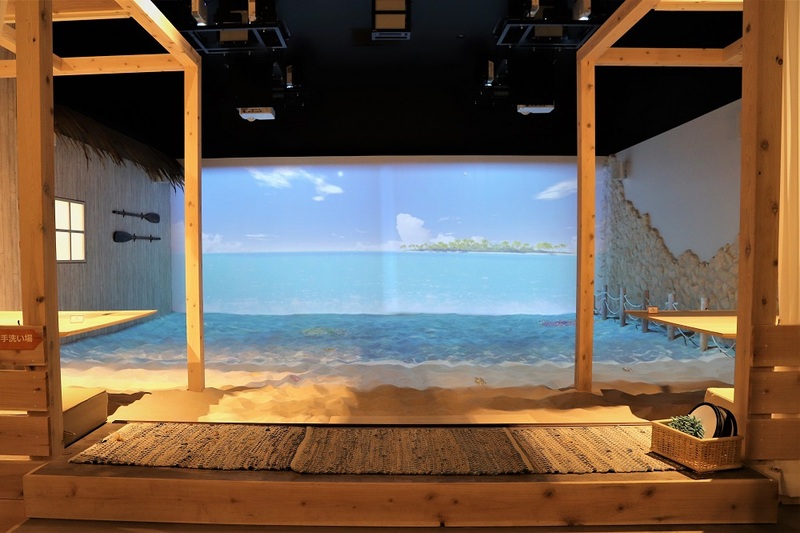 It makes sense in these Asian markets; where space is limited, VR presents an opportunity to craft experiences - both in and out of the home - that would otherwise be impossible, and help people escape that congestion, even if it's for only a time. It's a selling point that won't resonate in western markets, but to suggest that VR is in trouble when it appeals to the combined wealth and population sizes of China and Japan (and Korea, too), is simply insane.